Dorothy Comstock Riley was born on December 6, 1924 in Detroit, Michigan. Riley attended Detroit Public Schools as a child and graduated from Northwestern High School. She attended Wayne State University where she not only received her B.A. in 1946, but she was selected as Homecoming Queen. Riley received her LL.B in 1949 from Wayne State as well. Upon her graduation from law school, Riley interviewed with law firms. Unfortunately, women lawyers were unheard of at the time and the only question they asked of her was how fast she could type. As a result, Riley practiced on her own for six years, and by doing so, made a name for herself. Eventually, she was appointed Assistant Wayne County Friend of the Court. She married Wallace D. Riley, former President of the American Bar Association in 1967, and they had one son, Peter Comstock Riley. Riley was a Wayne County Circuit Judge and a Michigan Court of Appeals Judge. She practiced law and was a partner in the firm of Riley and Roumell. Throughout her career, Riley had been involved in a number of professional and community organizations. She was a member of many organizations that celebrate professional women. Riley joined the Michigan Supreme Court upon the death of Blair Moody, Jr. “Her thirteen years as a Supreme Court justice began and ended in controversy. Her appointment to the Court in 1982 set off a partisan power struggle that at one point pushed her back off the Court until the following election.” She was said to have handled the entire situation with dignity and grace. Riley received overwhelming support from voters and found herself back on the Bench in 1985, becoming the first Hispanic woman to be elected to a state supreme court. 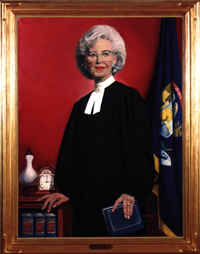 She served as Chief Justice from 1987 until 1991.